A local meat producer celebrating its 150th anniversary in 2019 has bought the naming rights for Buffalo's downtown baseball stadium. 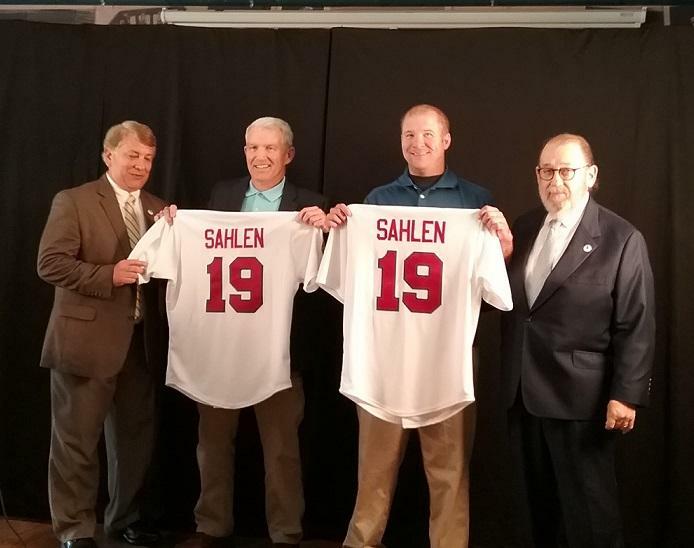 For the next 10 years, the Bisons' home ballpark will be known as Sahlen Field, team officials announced Tuesday. 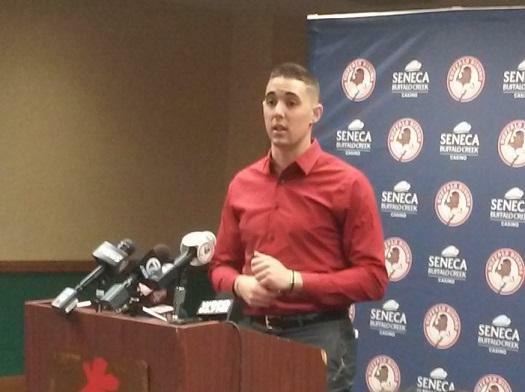 The top prospect in all of baseball made his debut with the Buffalo Bisons Tuesday night. Vladimir Guerrero Jr., son of hall of famer Vladimir Guerrero, had a relatively uneventful performance in front of a large crowd at Coca-Cola Field even though the Bisons lost to the Lehigh Valley Iron Pigs 11-8. It’s only a matter of time before he gets promoted to the Toronto Blue Jays. Until then, the 19-year old phenom will develop his skills in Buffalo. WBFO’s Nick Lippa reports. Starting Fourth of July celebrations on the third of the month has become a Western New York tradition, started by the Buffalo Bisons more than two decades ago. For this year's celebration, the Herd is offering new twists on a classic tradition. 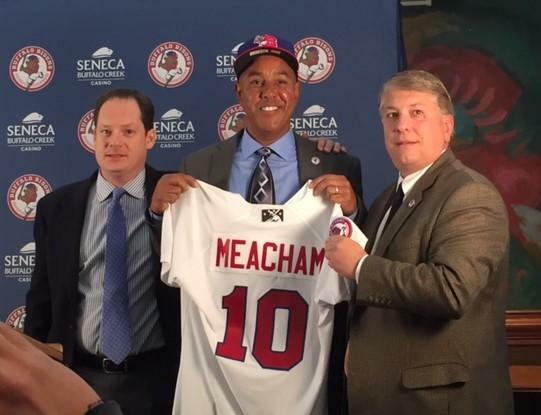 A recently-published column recommends the Buffalo Bisons, upon the conclusion of its current stadium naming rights agreement, rebrand the downtown ballpark in honor of one of its legendary players. Although baseball enthusiasts say Luke Easter was indeed one of the greatest to ever wear the Bisons uniform, the minor league baseball club says it could not afford to pass up the revenue that will be generated from a new corporate sponsor. Mother nature has been especially cruel to the Buffalo Bisons, who saw most of their first regular season homestand wiped out by weather. They paid a visit Wednesday to a facility other than Coca Cola Field in order to keep the players conditioned as they continue through a forced layoff. 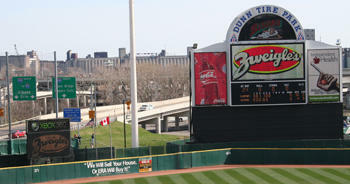 The Buffalo Bisons open their season tonight on the road against the Rochester Red wings weather permitting. They look to bounce back this year after a disappointing 2017 season. 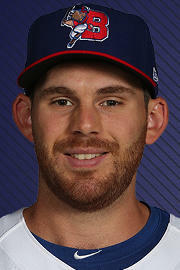 They’ll have some help to start from a pitcher/comedian with major league experience, Joe Biagini. The start of spring means baseball is right around the corner. 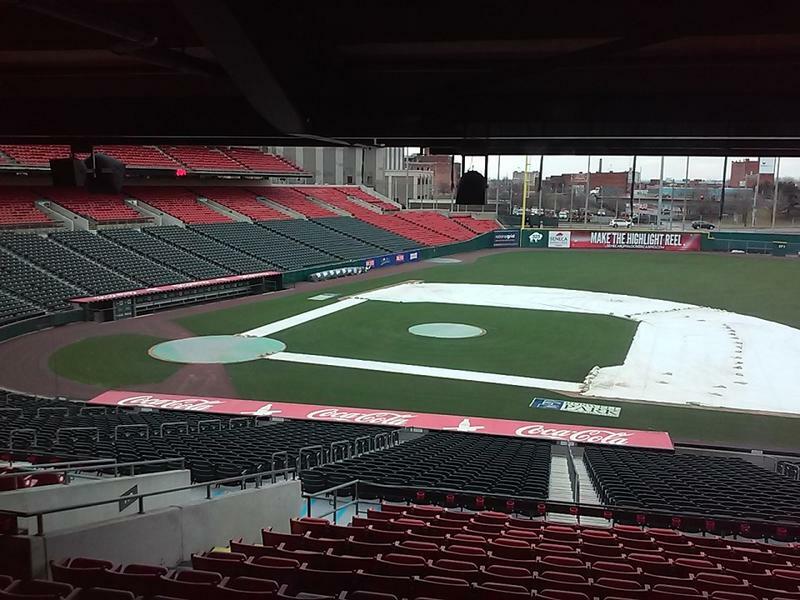 The Buffalo Bisons will start their 31st season at Coca-Cola Field in less than three weeks. Thursday they hosted their annual preseason "What’s New at the Ballpark" preview. 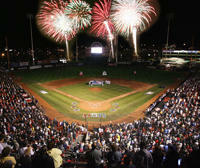 Going to a baseball game this season? Leave your cigarettes at home. 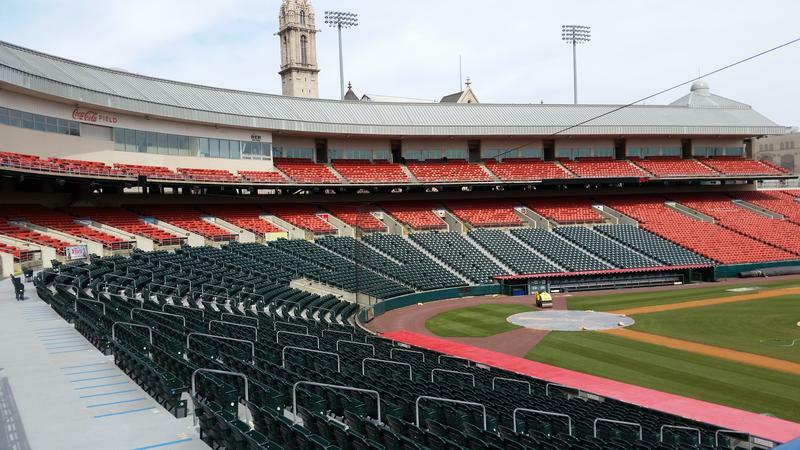 Local baseball fans will need to wait a couple extra days for the Buffalo Bisons' season-opening home game. The International League club announced Wednesday that in anticipation of the weather expected Thursday and Friday, they will move their games against Scranton/Wilkes-Barre to the weekend. In less than two weeks, weather permitting, the sounds of baseball will be back in downtown Buffalo. So, too, will some new tastes and sights. The Buffalo Bisons will play their 30th season in Coca Cola Field this year. On Thursday, they hosted their annual preseason "What's New at the Ballpark" presentation at Pettibones Grille inside the stadium. WBFO's Michael Mroziak interviews Buffalo Bisons general manager Mike Buczkowski about "What's New" at Coca Cola Field and the with the baseball club this coming season. 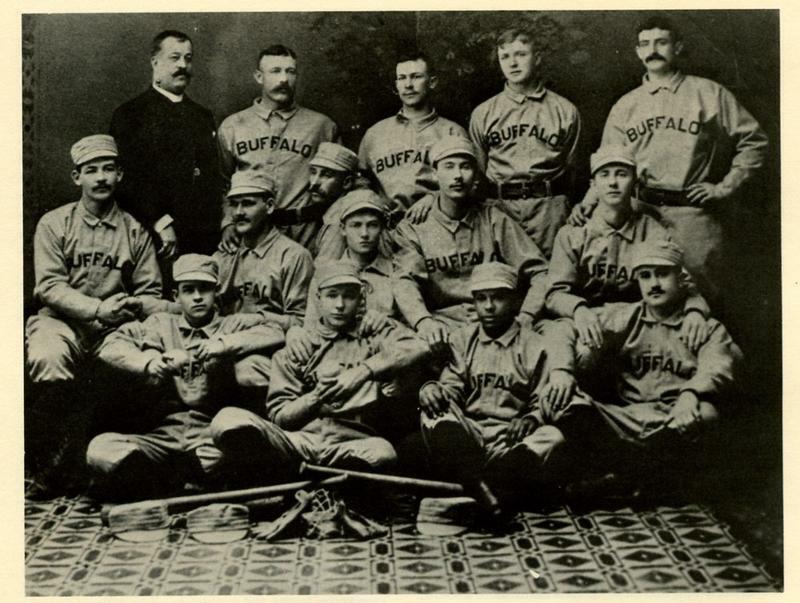 A newly-published book, Baseball in Buffalo, offers images of "America's Pastime" as it was played in Buffalo and Western New York since the mid-1800s. 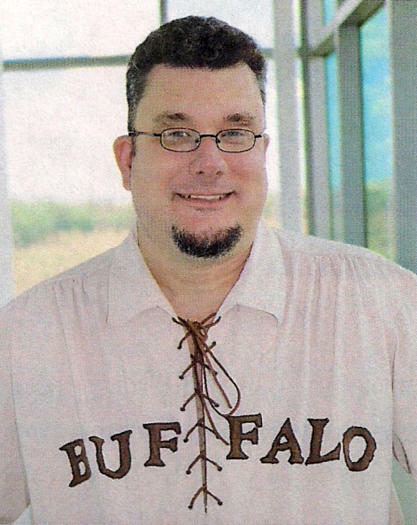 WBFO's Michael Mroziak spoke with those who put together a new book, Baseball in Buffalo, celebrating the game as it was played in Western New York, from pro teams and former stadiums to personalities and moments of historic significance. The Buffalo Bisons will join the ranks of the Sabres and Bills when they utilize metal detectors at home games, beginning this spring. 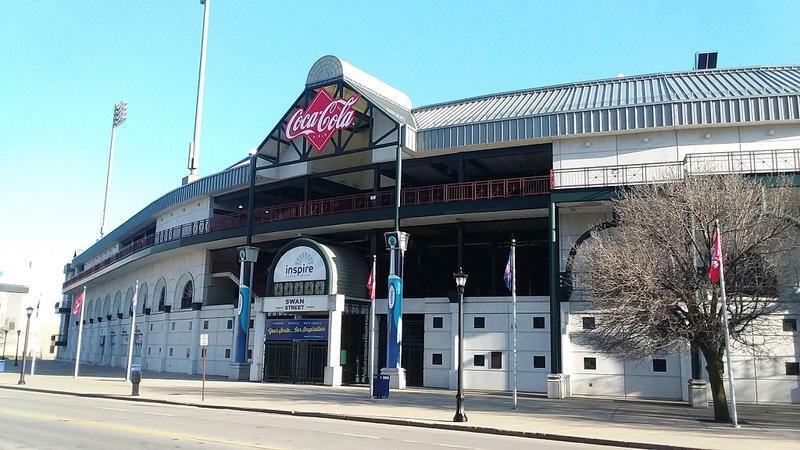 The minor league baseball club announced updated security measures Monday, less than two months before their scheduled home opener. 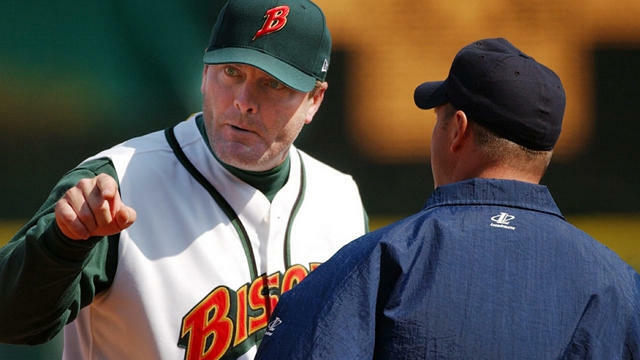 The Buffalo Bisons have a new manager and he is not an unfamiliar figure. The club also made history with the hiring. 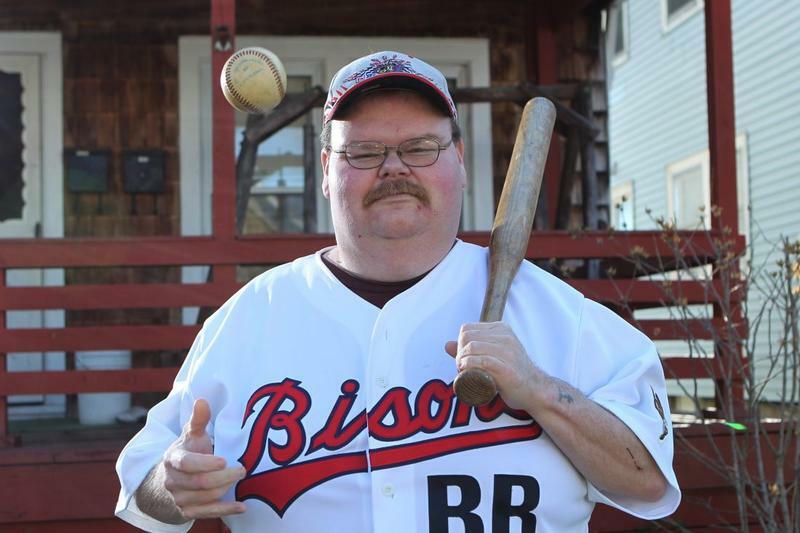 For years he was a favorite at Buffalo Bisons games, shagging foul balls on the sidelines, but always on the frontline of local baseball personalities. Donald Palmer, known as "The Butcher," has died at the age of 49 in his Riverside home. With the Cubs winning, will baseball enjoy a rise in popularity? Baseball is known as the "national pastime," but it sometimes requires a special moment in the sport to get many Americans to fall back in love with the sport. The Chicago Cubs winning their first World Series title in more than a century is the latest feel-good story for the game. 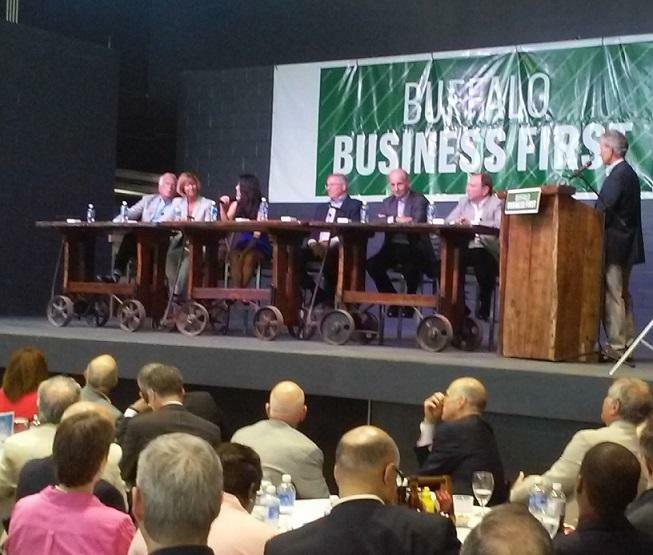 WBFO asked a local baseball promoter whether it will spark renewed interest in the sport. The Buffalo Bisons are still in the final weeks of their 2016 baseball season, but already making plans for the off-season and next season. This includes capital improvements at Coca Cola Field, most notably the replacement of more original red seats with new, wider green units like the ones installed last year. 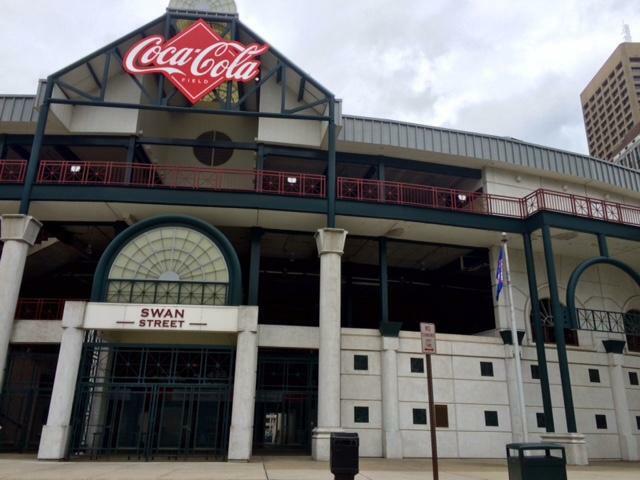 The Buffalo Bisons play their home opener Thursday afternoon and fans attending the game will notice some new additions at Coca-Cola Field. The organization says it is committed to enhancing the fan experience, but will they knock it out of the park? WBFO’s Ryan Beiter has a preview. 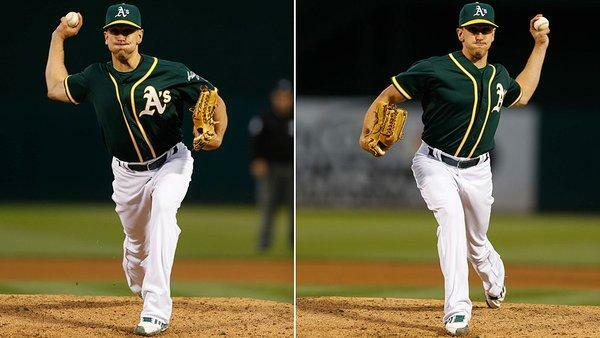 Switch hitters aren't uncommon in baseball but switch pitchers are very rare. In fact, the rules have been changed Pat Venditte, the Buffalo Bisons pitcher who will need to inform the batter which hand he will use. Former Buffalo Bisons manager Eric Wedge has been hired by the Toronto Blue Jays as the team's Player Development Advisor. 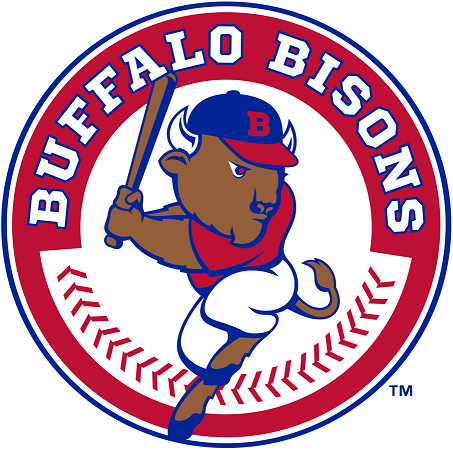 The Buffalo Bisons are hoping the success of their big league baseball affiliate, the Toronto Blue Jays, translates into more interest in the prospects playing in Buffalo. But months before the season opener, team officials are concerned about the declining Canadian dollar and how it may affect the turnout by Ontario-based fans. The members of a local fan club will be among the many in attendance for tonight's release of "Star Wars: The Force Awakens." "We're excited to see where they take it," said Chris Solecki of the North Ridge, the local Star Wars fan club. The families who own Buffalo's professional sports teams, another local businessman who owns an out-of-town hockey club and a major league's commissioner were all at the same table in Buffalo on Thursday. Among the topics they discussed: the intangibles of owning a sports franchise, and whether success can be measured in the same way as it is measured in other industries. It was the Buffalo Bisons' day to celebrate, as the minor league baseball team opened its 2015 International League season by hosting Rochester Thursday afternoon at Coca-Cola Field. Helping them celebrate was Buffalo's new football coach. 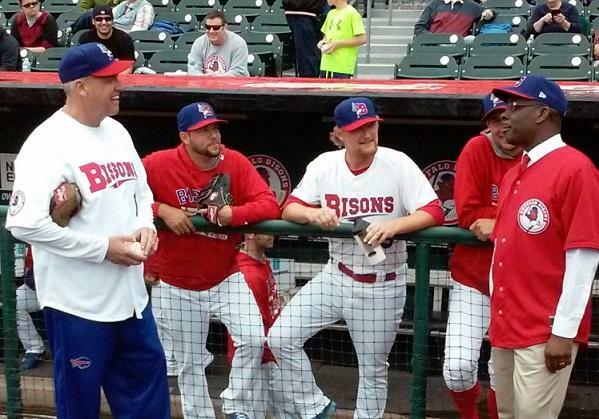 Rex Ryan's media briefing, following Thursday's ceremonial first pitch at the Buffalo Bisons season opener. Courtesy of Ben Wagner, the "Voice of the Bisons"
It's opening day at the ballpark as The Buffalo Bisons host the Rochester Red Wings at Coca Cola Field Thursday afternoon. Baseball fans have two more weeks to wait for the 130th season of professional baseball in Buffalo. As a sign that first pitch is warming up, the Coca-Cola Field grass was cut for the first time Wednesday. 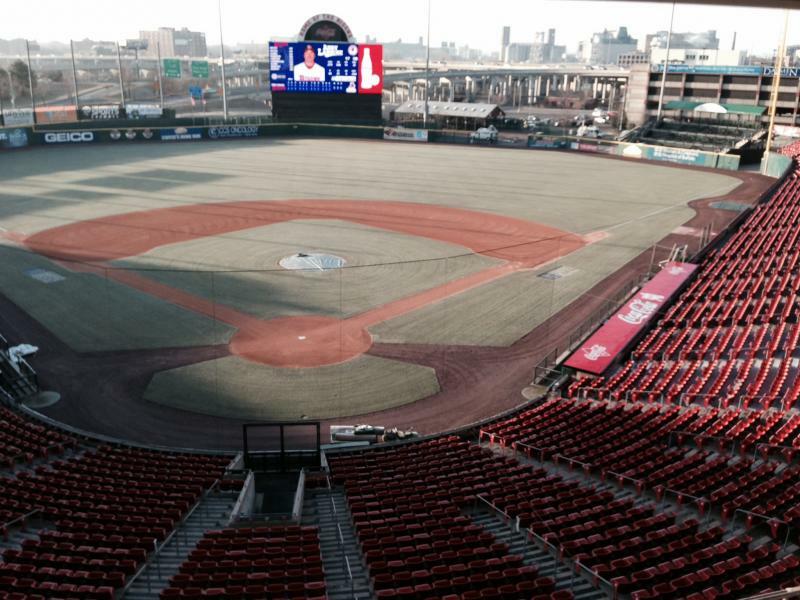 Press Pass: Is it time to upgrade the Bisons' ballpark? 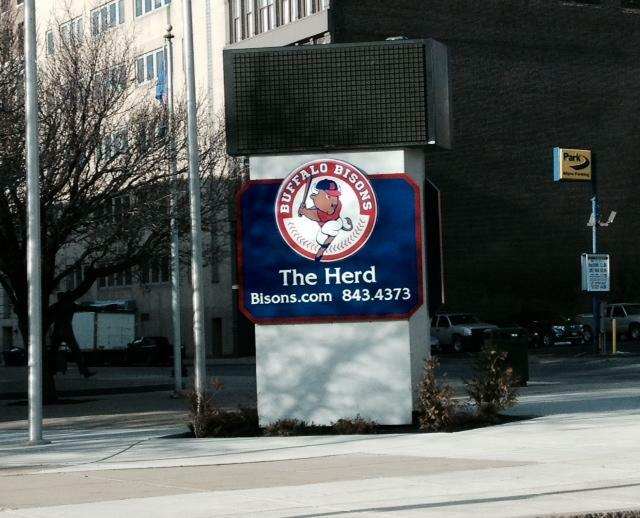 Should Coca-Cola Field -- home to the Buffalo Bisons -- undergo a modernization? That's the question recently explored by Buffalo News reporter Brian Meyer in an extensive news article. WBFO'S Eileen Buckley discusses the future of the ballpark with Meyer in this morning's Press Pass conversation. The Buffalo Bisons begin another season of baseball at Coca-Cola Field. At the ballpark early this morning, team announcer Ben Wagner told WBFO News, "Everything is getting a thumbs up and we are ready for baseball!" 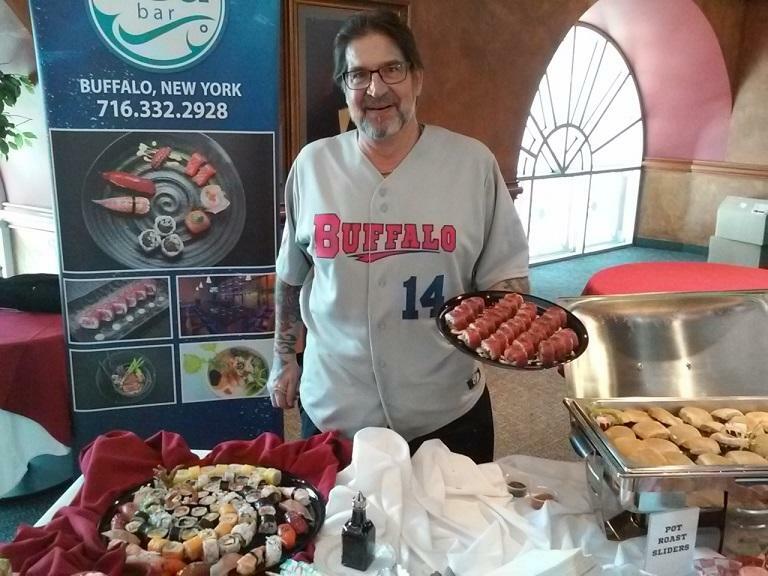 The Buffalo Bisons open the new baseball season in a little more than a week, with new food options ready to go for fans.